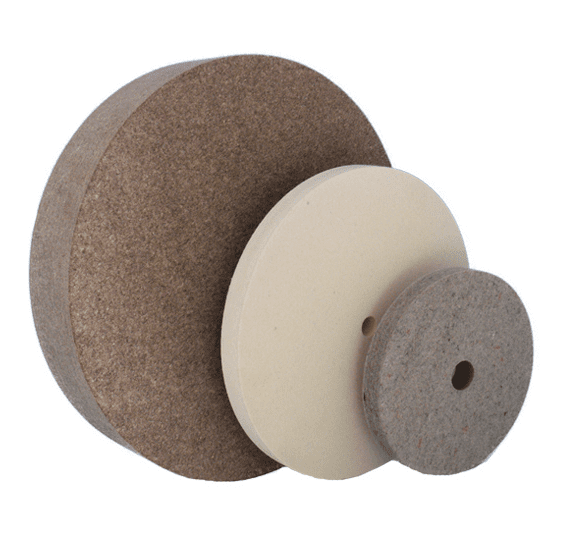 The choice of the right felt wheel for grinding and/or polishing with the most suitable degree of hardness and the required degree of quality must be determined customer-specifically according to the respective application. With our experience of many years we advise you gladly by telephone or with you locally regarding a qualitatively high-quality and economical execution of felt grinding wheels and/or felt polishing wheels for your process. Felt wheels, such as grinding wheels, grinding belts, etc., fall under the category of “rigidly bonded abrasives”. As conventional abrasive carriers, felt discs are coated with glue and then sprinkled with emery. The felt wheel can then be used as a grinding wheel (so-called Pliestscheibe). Used together with a brush paste, a felt disc can be used to remove small burrs on a workpiece, for example, or to remove knives and scissors. Felt polishing discs are mainly used in the field of high-gloss polishing. They are used both in the metalworking industry together with polishing paste and in the plastics processing industry together with polishing wax. Further areas of application for felt polishing wheels are the polishing of precious stones and the rough and fine grinding of light metals. Hair felt is 100% animal hair and therefore meets the highest quality standards for felt discs. Wool felt is basically the cheaper alternative to hair felt and not as high quality as hair felt. The merino wool felt is made from merino wool of the merino sheep (breed) and is very fine and soft. For felt discs up to a diameter of 450 mm, the maximum cutting speed is 35 m/s. For felt discs exceeding this diameter, the maximum cutting speed is 20 m/s. For felt discs up to a diameter of 450 mm, the maximum cutting speed is 35 m/s. For felt discs larger than this diameter, the maximum cutting speed is 20 m/s. The maximum cutting speed for felt discs up to 450 mm diameter is 35 m/s.